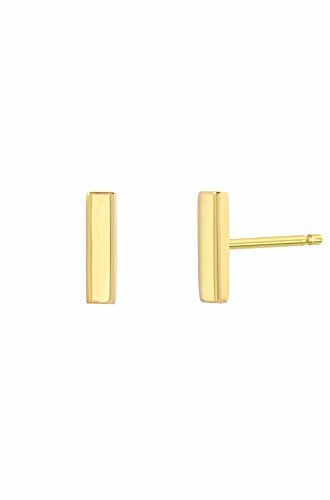 Chic and dainty 14k solid gold bar stud earrings (sold as a pair) available in 14k white and yellow gold, wear them day or night, a classic and timeless pair of studs. Made in L.A. Size of bar: Approx. 0.5''(H) by 0.5''(W) Weight : Approx. 0.12 Grams Ships in 2-4 business days Comes gift ready in a beautiful jewelry box wrapped in a satin ribbon. If you have any questions about this product by Zoe Lev Jewelry, contact us by completing and submitting the form below. If you are looking for a specif part number, please include it with your message. Genuine peridot stud earrings, in 14K white gold. AAA quality natural peridot from Arizona. 5mm.